Ordering custom patches can be complex, at Artik we work hard to simplify the process so you get high quality embroidered patches on time with no big head aches! - The easiest way to get started is to Contact us. - Our expert embroidery team will help you determine pricing, design and schedule so you'll know if Artik is the right choice for you. Custom Embroidered Patch Size is the average of your design's Width & Height. eg. your design is 4" by 2". (4+2)/2 = 3". Therefore Patch Size is 3". We've embroidered thousands of custom patches right here in downtown Toronto! At Artik, we believe that every custom patch is a unique piece of art and technical mastery. We’ve spent the last 35 years becoming Toronto’s expert embroidery team, creating badges for the largest corporations in Canada and crests for governmental organizations. We’ve also created some stunning embroidered patches for local Toronto and Montreal artists. We’ve been creating custom crests for police, custom embroidered fire department crests, custom ambulance crests, paramedic patches and custom embroidered crests for security companies for years now. We’ve even created custom crests and uniform badges for search and rescue teams. Our team has the expertise and machinery to produce top quality custom embroidered crests, all made right here in Toronto! 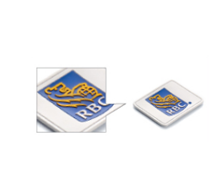 Cut out the middlemen to get the best pricing for custom crests. We’ve also focused on creating top quality embroidered logo patches for uniforms and merchandising material. Our team has 35+ years of experience here in Toronto producing custom embroidered corporate patches. Those in the martial arts are some of our most frequent clients here at Artik, we’ve printed custom patches and embroidered crests for Taekwondo, Karate, Muay Thai, and BJJ. Ordering custom martial arts patches can feel complex, but we at Artik are here to make it simple. Just reach out to our team to get started with your custom martial arts embroidered patches. Musicians and bands are always coming to Artik to order custom band patches for denim vests, motorcycle jackets, backpacks and varsity jackets. If you’re a musician or representing a band, you may know Artik by our reputation. We’ve been creating embroidered patches for bands for over 35 years now, and we see a lot of repeat customers. When it comes to embroidered patches for bands, we’re Toronto’s expert team. We’re fast, we’re affordable and we’re friendly. Does your sports team have an awesome logo? Order custom sports team patches from Artik Toronto. Our embroidery team is based right here in Toronto, meaning you’ll have top quality embroidery created by true experts without middlemen raising the price. We’ve created custom embroidered sports team badges and crests for all kinds of sports teams ­– from football teams to soccer and baseball teams here in Ontario. Whether you’re running a charity that needs custom embroidered iron-on patches, or you run a company that needs custom embroidered name badges with logos, Artik Toronto is your trusted embroidery supplier. 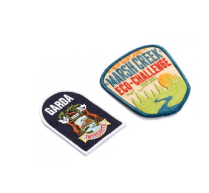 Custom patches and embroidered crests are an awesome promotional product for all kinds! We at Artik hope to be your custom embroidery experts, reach out to us for advice, embroidery tips or a price quote. Our team has 35+ years of embroidery experience; contact our friendly team to get started with your embroidery order!